Heavy to very heavy rains at isolated places very likely over East Rajasthan and heavy rain at isolated places over Arunachal Pradesh, Assam & Meghalaya, Nagaland, Manipur, Mizoram & Tripura, Sub-Himalayan West Bengal and Sikkim, Odisha, West Uttar Pradesh, Punjab, Haryana, Chandigarh & Delhi, Himachal Pradesh, West MadhyaPradesh and Gujarat region. Dry spell in TN expected to end for TN in one or two days. Isolated to fairly widespread rainfall is expected from 10th in Tamil Nadu and Pudhucherry. 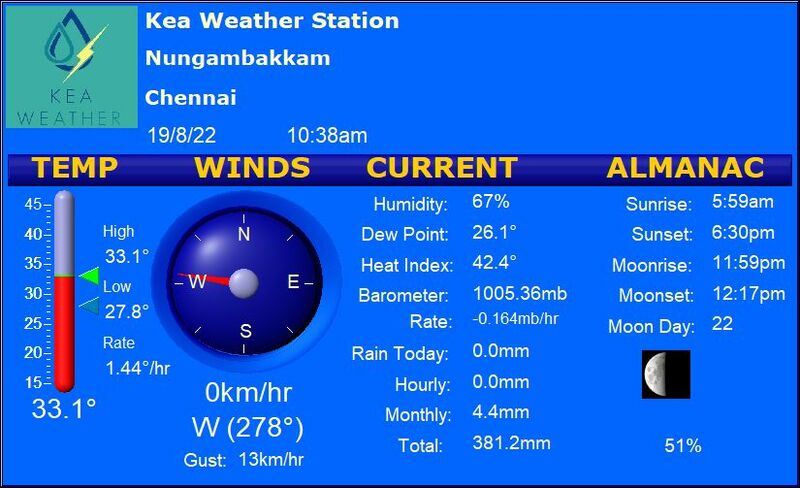 Chennai – Warm day with a high of 35/36 degrees. Chance of showers during evening/night. Coimbatore – A cool and comfortable morning turning slightly warm with a day high of 33 degrees C. Spotty showers are possible. Madurai – A warm day with a high of 38 degrees to expect. A chance of a shower or two. Trichy – Mix of sun and clouds with a daytime high of 39 degrees. Chance of a shower or two exists. Vellore – A day laden with clouds and Sun, high of about 38 degrees, chances of thundery development towards the evening.